I used Amanda Jean Nyberg's Just Four Fun pattern found on Craftsy for this quilt. 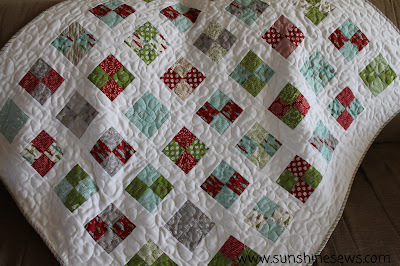 The fabrics are from Sweetwater's Holly's Tree Farm collection and they make a nice holiday quilt for this season. I thought I would experiment with using linen for the sashing, borders and backing. I feared that the quilt might be heavy from the weight of the linen but it was not heavy at all. The linen was quite a find. A friend from church mentioned that she was cleaning out her aunt's house to hold an estate sale and there is a room just filled with fabric. She invited our church quilt group to come to the sale a day ahead of time to purchase the fabric for a dollar a yard. I was definitely interested so I went to the sale. I found tons and tons of nice cottons but unfortunately most were not my style so I passed on them. Then I noticed a table just filled with linen fabrics. The entire table was heaping and most of the fabrics were in 7 - 8 yard cuts. I was in heaven. I piled all the neutral cuts of fabric up to purchase. The pile was so heavy I was worried that I wasn't going to be able to lift it! When I went to pay for my selections, I told my friend that I was certain I had at least 45 yards of fabric, she looked at the stack and said, "How's five dollars?" OMG! I offered her more but she refused so I got a wonderful stack of linens for close to nothing. I promised her they would not go to waste. So this was my first opportunity to use some of the linen and even though it shredded a bit during the piecing process, it turned out beautifully and was not difficult to work with. Tomorrow this quilt will be in the Elna show at my local quilt shop. This is the first quilt I made with my new Elna machine. I did not plan on doing any Black Friday shopping. I was successful in that endeavor. Then came Saturday morning. It was 5:45 am when my husband asked me if I was heading out to any stores. I think he secretly loves Black Friday but he will never admit it. After all, he came home yesterday with tons of "deals" he found as he went out and about. I told him no, I was not planning on doing any shopping at all. I don't know why, but I thought Joann Fabrics opened at 6 am today. After I told my husband I was not going shopping, he mentioned that I told him that quilting fabrics were 60% off which is very rare. And that's why he figured I was going to head out today. Like I said, he secretly likes shopping so I think he is disappointed that I don't enjoy it like he does. Then a funny thing happened...I looked at the clock and it was now 6:04 am and I got this crazy panicky feeling and a big sense of regret. I hopped in the shower and told myself to get over it, there will always be another sale. I got dressed and headed back downstairs for breakfast and took out the newspaper. There was that darn Joanns flyer staring at me. As I looked at it I realized that the top of the Saturday page stated that the stores open at 9 today! I did not miss the sale at all. In fact, I am dressed and ready. As my resolve to stay home faded away, I got in the car and headed out just in time to be the third person in the door when they opened at 9. None of the other shoppers were after the quilting cottons so I had first pick. It was a nice relaxing shopping experience, in fact everyone in the store was cheery. 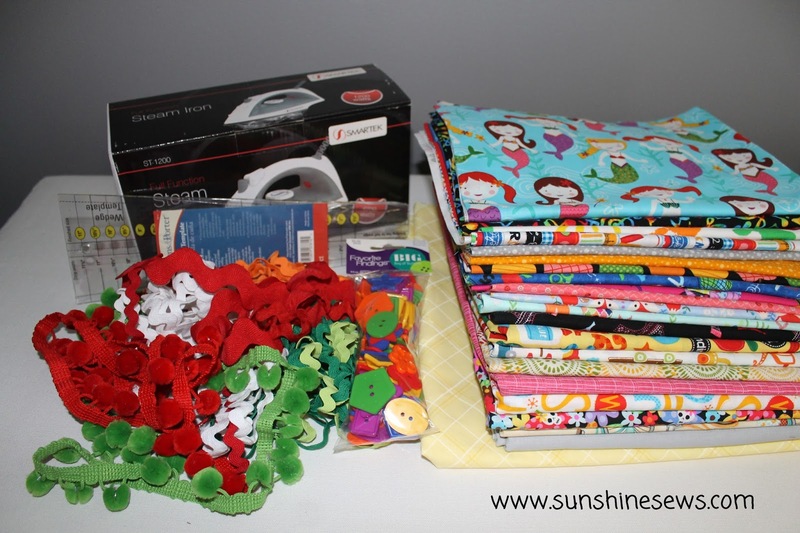 After having my giant pile of fabric cut, I perused the store for a very long time. After all, a deal is a deal. So here is my new stash items along with a $5.99 iron. I figured I would use that iron for fusibles. Even with using the protective pressing paper, sometimes I get goo on my good iron. Now maybe I can keep that iron cleaner. Tonight at church we had a quilt blessing at the beginning of the service. It was wonderful to hear our pastor speak about the work we do and the effect it has on those in need. We placed the quilts on the chairs in the church so people could sit and lean back on them. There were many comments about them and it felt really heart warming to get all at positive feedback. I would have loved to take photos during the service but that would be rude so I took these shots half an hour before church began. Now that the service is over we will sort them and my husband's Legion group will take some over to the VA Hospital as part of their Christmas visit and the rest will go to a local homeless shelter. I am already looking forward to next year and making more. I made this plus sign quilt using low volume fabrics for the background. I like the way the background has movement due to the various shades of the soft grays and beige. 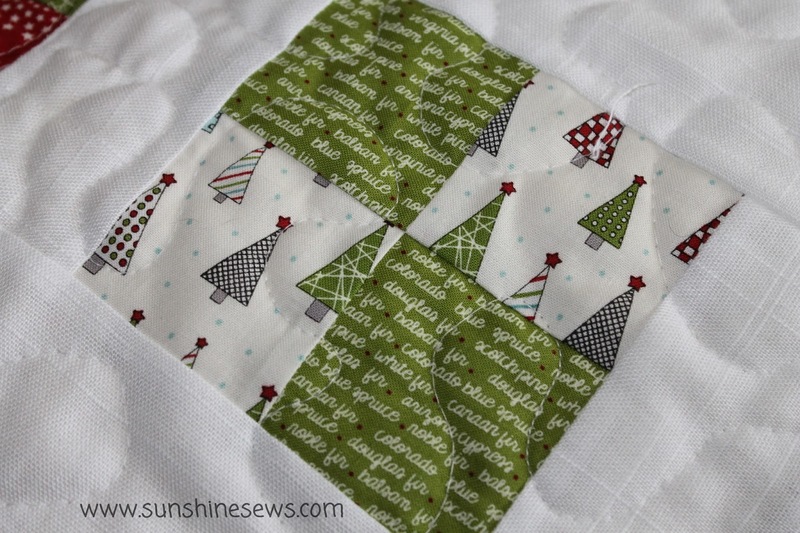 I used charm squares as well as some yardage to make the 5-inch blocks found in the background of the quilt. The plus signs are made from fabric scraps. 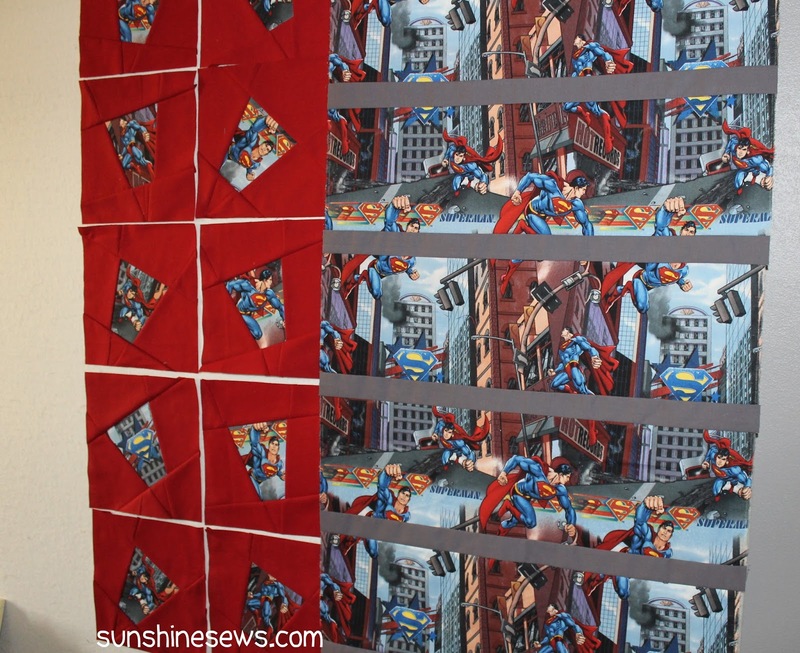 I made this quilt using a piece of Superman fabric I got from the Quilts for Kids stash. I really wanted to keep the scenery in tact so it tells a story. So I chose to make it look like something like a film reel. However, the pieces of fabric weren't all that wide but they were long so I had to improvise to get to a nice lap size. 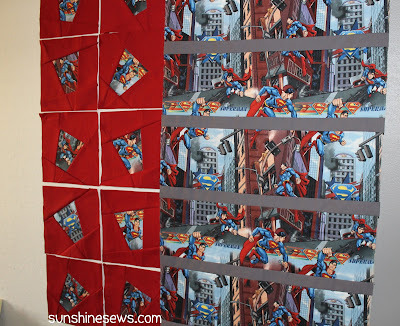 I chose to take some of the Superman fabric and make tipsy tumbler blocks by fussy cutting the Superman figures from the fabric. 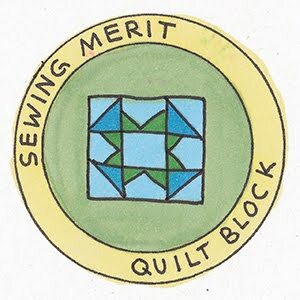 I found the instructions for the block on the Missouri Star Quilt Company website. 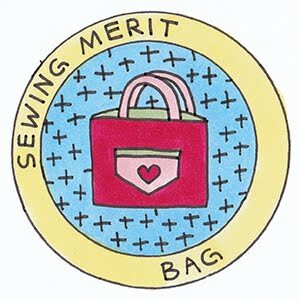 They are a great source of inspiration for quilting. The tumbler blocks went together very quickly and easily. In fact, they were fun to make. I backed the quilt in a light blue fabric I found in my personal stash and free-motion quilted it for a quick finish. I entered a scrap quilt challenge a few months ago and I won a prize. I entered my wonky stars quilt since it was a perfect fit for the requirements to enter. So today I got this package in the mail. I know I should be grateful for the prize but I have to admit, I do not like batiks. I tried to like them. I've made project with them but I just can't seem to get to a place where I want to work with them. Actually I am grateful that I got such a generous gift however, I will have to find a way to pay it forward to someone who will love it and enjoy using it. I thank the person who donated this to the scrap quilt challenge. I do appreciate the acknowledgement. 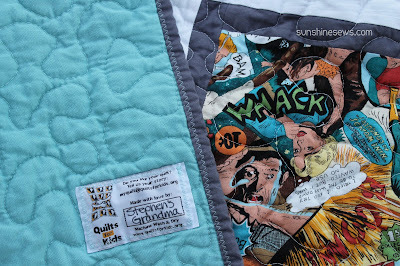 My first free-motion quilting project on my new machine is my selvage quilt. I made the top a few months ago and I wasn't sure what I was going to use for the back. I recently went to the fabric store and picked out some fabric that I was sure would be perfect (without taking the quilt top with me) and of course when I got home, it was a terrible match. Just as I folded up the fabric and placed it on my shelf, I noticed a stack of new fabric I forgot about. I went to a clearance sale last week and bought some fabrics for my stash. Some were so deeply discounted that I bought enough to make quilt backs. Lo and behold. the piece on the bottom of that stack looked like a perfect match! I pulled out the fabric and laid it on the quilt top and I was right this time. It was just what I was looking for. So after pinning the layers together, I quickly got started on my first FMQ project on my new machine. I did have to read the instructions on how to wind a bobbin first. I discovered a really cool feature; since I was using a different color thread on the bobbin, I could leave the thread loaded on the machine and wind the bobbins without changing the thread out. What a wonderful feature! Once I got started, it only took me just a little over an hour to finish quilting the piece. Then I chose some leftover Sweetwater fabric from my stash for the binding and completed the project. 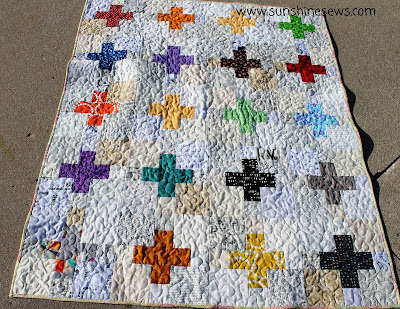 I tried to photograph the quilt outdoors but it was too sunny to get a nice shot. However, I did get a great shot of the fall colors on the tree in front of our house. I have had my Husqvarna Rose sewing and embroidery machine since 1997. That is a long time. As my machine started to age which I only noticed each time I had to bring it in for repair, I started to look at other machines. That is an overwhelming thing. There are so many machines that offer so many different features that I realized I needed to pay attention to the things I like about my machines as well as the things I didn't like. It's been two years since I started that process. I also started a wish list of the things I would like my next machine to have. The funny thing is my wish list wasn't all that long. I wanted a bigger throat space and the knee lifter. That's it. My Rose is an embroidery machine. It has the hoops and the software for making various embroidery designs. I used it twice. Yes, twice in 18 years. That is not a good return on the investment. I hope my husband doesn't read this; he bought me the machine and it was not cheap. 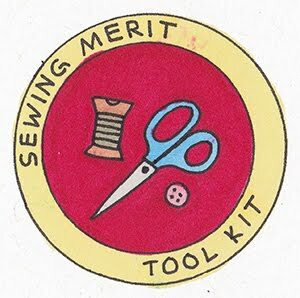 I did use the many embroidery stitches on the machine when the kids were growing up and I made their clothes and the girl's dolls' clothes. 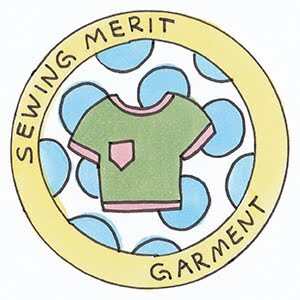 But after I quit garment sewing there was no need for all that. Lately my Rose requires more intervention. In order to make it work smoothly, I have to let the machine warm up. If I don't, the thread sensor beeps constantly driving me crazy. I could take it in for repair again but it's starting to get costly. It is time to get a new machine. Introducing the Elna 680. It is a machine designed for quilting. It has a larger throat space and the knee lifter for the presser foot. If you ask me it still has too many stitches but that's not the end of the world. The machine was reasonably priced, unlike my Rose so it won't take me long to get the return on my investment. 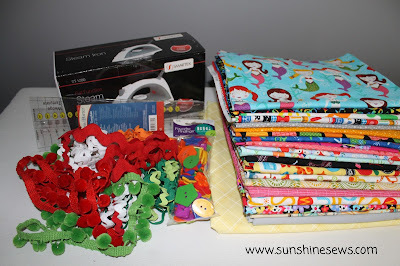 I can't wait to get started on my next free motion quilting project to try it out. I had a piece of comic book fabric from the Quilts for Kids donated fabric stash. It wasn't big enough to make a large quilt out of so I had to do some creative sewing to use it in a quilt. I decided to try a shadow box quilt and just make bigger sashing around the blocks in order to make the quilt a decent size. There are plenty of free shadow box tutorials online so I just plucked one from the internet and made as many blocks as I could. I could only get 12 ten-inch pieces from the fabric. There were two smaller strips left over so I cut as many squares out of it as I could until there was nothing left. Because this fabric was not directional, I lost track of which end was up. So I made a really huge mistake. Half the blocks are right-side up and the other half are up-side down. The 'shadows' should all be on the same sides! 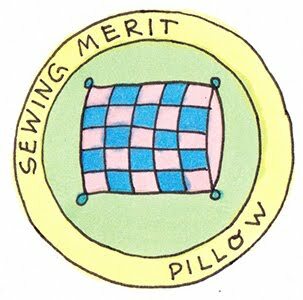 Unfortunately, I never noticed...not even when I was free-motion quilting it. It came to my attention when I took the photos. So it was way too late to make any correction. Oh well. The other day I was perusing the Missouri Star Quilt Company's website. The ladies at my QfK meetings rave about their site and have used many of their free quilt tutorials to make donated quilts. I instantly wanted to make at least 5 quilts from the free patterns I saw. The thing about my donated quilts is that sometimes I have a piece of fabric without a pattern. 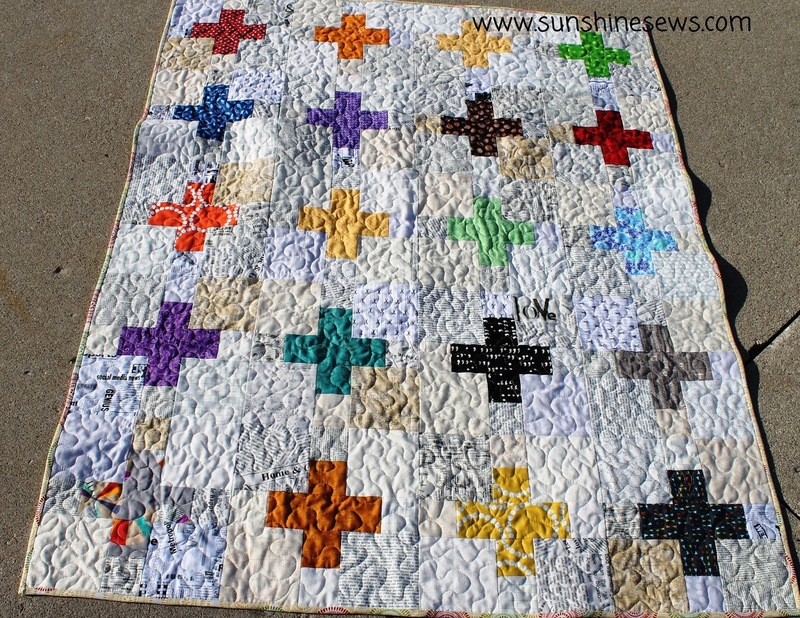 The size of the piece will dictate the quilt pattern. That was the case with the Superman fabric piece. I really wanted to showcase the scenery in the fabric and still do something creative. Enter the Tipsy Tumbler free tutorial! I cut the larger piece into sections that I will border with some narrow sashing in gray. Then I fussy cut the tumbler blocks out of the narrow fabric piece I had left. I sewed them into a red block that goes well with the large piece of focus fabric. I want to use the tipsy tumbler blocks as a border around the larger pieces. I have to make a few more tumbler blocks before I can lay it out but the process is going rather quickly so it won't take me long to get this quilt top done.